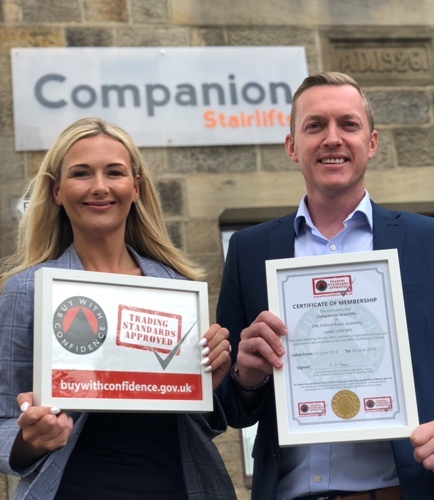 Guiseley-based stairlift and easy bathing solutions company Companion has become a member of Trading Standards’ Buy With Confidence approved trader scheme, as part of its strategy to reassure customers of its commitment to quality standards and excellent service. June is Scams Awareness Month and many organisations are issuing advice about how to stay safe and avoid the cowboys and fraudsters keen to part people from their money. Citizens Advice research shows that almost three-quarters (72 per cent) of people surveyed had been targeted by scammers over a two year period (2015-2017). Over a third, had been targeted five or more times. Companion provides straight and curved stairlifts as well as accessible bathing solutions to customers across the UK. Many of its customers are elderly or have limited mobility; they are some of society’s most vulnerable and as such are frequently targeted by fraudsters. Sales and marketing director David Harrison said: “We know that customer testimonials and third-party endorsements by reputable organisations play a huge part in the decision-making process when it comes to buying independent living aids such as stairlifts and accessible bathrooms. In June, Companion was granted membership to Trading Standards’ Buy With Confidence approved trader scheme, the largest of its kind nationally. In order to become a member, a business must pass a set of tailored background checks. Membership of the scheme is not given lightly – amongst other checks, each applicant has their complaints history reviewed and receives a visit from Trading Standards. Good references are required from previous customers and applicants must agree to abide by the scheme’s code of conduct, which requires them to follow the letter and spirit of the law. Companion is also a Which? Trusted Trader, holds a Feefo Gold Trusted Service Award 2018 and has a TrustPilot score of 9.1/10. It is a member of the British Healthcare Trades Association, whose Code of Practice is the first in the healthcare industry to have been approved by the Chartered Trading Standards Institute, and a retail partner of the British Institute of Kitchen Bedroom and Bathroom Installation (BiKBBI). “We advise everyone who makes an enquiry with us to shop around and we don’t put any pressure on people to make a decision. The feedback we get from customers shows how much they appreciate our approach, and we constantly monitor all the review channels to make sure we are getting it right when it comes to customer service,” he added. Companion’s strategy is helping to build its reputation and drive growth. In 2017, stairlift sales increased by 16 percent and bathing solutions sales increased by 25 per cent.